SUMMARY: Users are challenged to recreate the mosaic on the screen using the mosaic tiles provided. 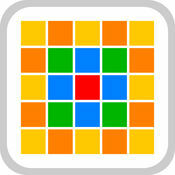 This app develops knowledge of pattern, spatial awareness and visual perception. TOP TIP: This app requires payment for access to all levels. For a more advanced version of this game, look into purchasing ‘My Mosaic 2’.